Christie worked at Lakeview Farms from 2003 until she was married and moved to the Springfield, MO area in 2013 -- a record 10 years. 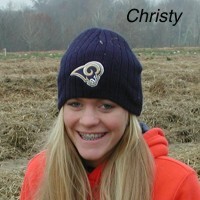 Christie was an excellent employee who always had a very positive outlook which meant she could deal with difficult customers much better than anyone else at Lakeview Farms. In seasons where we have a short crop (like 2007) we generally limit picking to only those customers that (according to our records) picked the previous year. In 2007, I had to position myself at the front entrance gate with a computer printout and turn away customers who did not have a strawberry picking card or show up on the 2006 "picked list". After a few very difficult customer encounters and a serious "you'll be sorry" customer threat, I turned the job over to Christie who handled it for the remained of the season without any problem. One of the other things that I remember about Christie is that she delayed cashing or depositing her paychecks and instead allowed them to stack up on her desk at home. Quite often that stack of undeposited paychecks would go back several months until Christie got around to it. For example, her last paycheck in June 2013 was not deposited until October.